Four singer/songwriters join forces to create really good original music, inspired by bands from many decades and genres, from rock to folk; reggae to country. Lonnie Martinez who's musical career began in Oakland, California, is a singer/songwriter, guitarist and percussionist. She is also a talented artist and teaches art and music to children when she is not on stage. Jeffrey Hefner is a singer/songwriter and multi-instrumentalist who has worked in the film industry in Hollywood for over 15 years in the sound department. Kelly Rush is also a songwriter and multi-instrumentalist. He too has worked for nearly two decades in the sound department on various hit television shows and feature films. Janine Cooper Ayres, who plays bass guitar in the band writes and sings too. 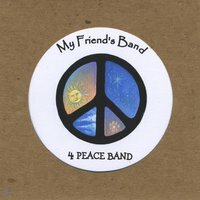 Their first CD "4 Peace Band" features three songs from each member.